Source: 328th Infantry, 82nd Division, AEF Memorial, Fort Bragg. Photograph by Project Staff. The memorial is a granite boulder approximately 6-feet long by 3-feet high. Carved into the front face is the red, white and blue painted “AA” (“All-American”) insignia from the shoulder patch of the 82nd Division (now the 82nd Airborne Division). Beneath the insignia is an inscription to members of the 328th Infantry Regiment of the 82nd Division who died while serving with the American Expeditionary Force (AEF) in France during World War I. The memorial was first located at Camp Gordon in Georgia, the World War I home of the division. When dedicated in 1933, a history of the 82nd Division, newspaper clippings about the 82nd, French and British coins and a Memorial Penny of the 82nd Division had been placed into the memorial’s base. Per discussions with staff at the 82nd Airborne War Memorial Museum, these items did not accompany the memorial when it was relocated to Ft. Bragg in 1960. The dedication was held in conjunction with a reunion of former unit officers held in Atlanta on September 2-4, 1933. General George B. Duncan who commanded the 82nd Division was on the dedication program as was General Julian R. Lindsey who commanded the 163rd Infantry Brigade of the 82nd during the war. Shortly after being formed in 1917 the 82nd was named the “All American” division because there were men, including many immigrants who did not speak English, from each of the 48 states. This was unique for the time as most divisions being organized encompassed men from three to five states. During World War I the division was comprised of two infantry brigades (163rd and 164th), a field artillery brigade (157th) and other divisional troops. The 328th was one of two infantry regiments in the 164th Infantry Brigade. Sergeant Alvin C. York, Medal of Honor winner and perhaps the greatest American hero of the war was a member of Company G, 328th Infantry. Camp Gordon, Georgia, was the original base of the 82nd Division and where they were organized in August of 1917. The division arrived in France in mid-1918 and saw action in several major offensives. After hostilities ended the 82nd Division returned to the United States and was deactivated in May 1919. With the United States entry into World War II the division was reactivated in March 1942 and in August re-designated as the 82nd Airborne Division, the first such unit in the U.S. Army. Sources seem to be confused about when the memorial was created. At one time, a sign next to the stone indicated that it was carved in 1919 by a Georgia stonemason. A Naval Air Station yearbook stated that it was placed at the first national convention of the 82nd Division which was held in Atlanta in 1930 with 5,000 veterans in attendance. The only confirmed mention of the memorial and the date used by this site are from 1933 newspaper articles announcing its dedication at a small reunion of about 75 former division officers. Staff at the 82nd Airborne Warfare Museum indicated their research also shows a dedication of 1933. In order to access the memorial marker, visitors need to have a Department of Defense ID card or would need to stop at the Welcome Center on the All American Freeway for check in procedures. The Welcome Center is on the left as one approaches the main access point booths. Adults will need to present a valid ID such as a state-issued driver’s license. 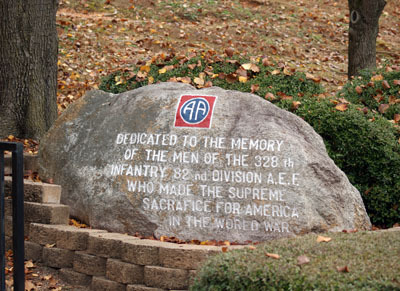 The memorial marker is located on the grounds of the 82nd Airborne Division Museum at Fort Bragg. The physical address is Building C-6841, 5108 Ardennes Street, Fort Bragg, North Carolina. The marker is located in a raised garden area outside the museum, surrounded by plantings and shade trees. The monument was originally located at Camp Gordon, Georgia, near the 328th’s Regimental Headquarter building used in World War I. During World War II this installation was converted into Naval Air Station-Atlanta. An airplane hangar replaced the headquarter building and the memorial was relocated to a site just inside the Naval Air Station main gate. The airfield was converted to civilian use in 1959 and became Peachtree-DeKalb Airport (PDK), as it is today. Circa 1960 the stone was moved to Ft. Bragg and placed in front of the 82nd Airborne Division War Memorial Museum. It was moved again to its current location in the 1980’s to make way for expansion of the museum.